H L Sunil Shantha -Kalutara Central Special Corr. G Pasan Ranuka Roshith Perera, a student of GCE Advanced Level Technology Class at Wadduwa Central College, Kalutara is an outstanding Karateka who has excelled in Karate tournament. Pasan, recently took part in the All Ceylon Inter-School Under 20 (men’s) Karate Tournament held at Sugathadasa Indoor Stadium, Colombo and won the third place in ‘Kata’ event winning a Bronze Medal. Pasan, who started learning Karate under the guidance of L P Edirisinghe the Sri Lanka Representative of Japan-Sri Lanka Karate Association and the Kalutara District Karate Trainer coach and Chief Instructor and the Visiting Lecturer of Karate at Pasdunrata College of Teacher-Training, Kalutara was able to win a medal at the very first Karate District Tournament held at Kalutara. 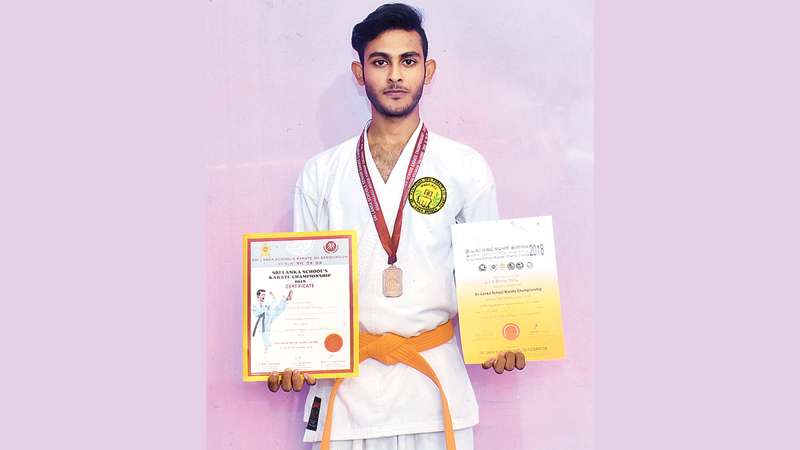 He participated in Kalutara District Inter-School Tournament held at the Auditorium of Pasdunrata Teacher-Training school and won the first place in ‘Kata’ event (under 19 men’s in 2018. Pasan won a Gold Medal at the Western Province Inter-School Under 20 (men’s) ‘Kata’ event, held at the Sugathadasa Stadium, Colombo. Pasan Ranuka at the moment is undergoing special training in Wado-Ryu Self-Defence Martial Arts (Karate) under the instructions and guidance of Master Trainer/Coach and Kalutara District Karate Chief Instructor L P Edirisinghe. “I’m really happy and satisfied with my pupil’s (Pasan Ranuka’s) special performance displayed in Karate, at the Sri Lanka Karate Tournament where he won a Bronze Medal and Wadduwa Central College’s Karate History was re-written in gold, by my student,” says L P Edirisinghe.